The fastest ship in the ocean just got faster. Corsair's XMS3 modules take performance to the next level and beyond. This dual channel kit has been tested together to work at 1600Hz at latencies of 9-9-9-24. Once the modules were tested they were immediately packaged to ensure that the matched sets stayed together. Corsair's legendary reliability is backed with a lifetime warranty. The dual path DHX aluminum heat spreaders on the modules help to extend their life by keeping them cool. The extended chip coolers are supplemented by a PCB cooler. Both sets of coolers are finned for extra surface area. The chip coolers are ribbed for maximum cooling area. Win the race with Corsair XMS3 memory modules. DDR3 1600 DDR3 1600 delivers amazing performance and platform compatibility with up 12800MB/s memory bandwidth per channel for the ultimate work and gaming power! 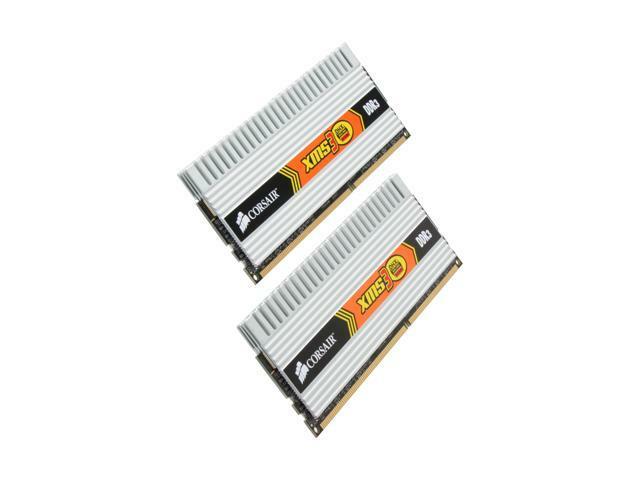 Corsair XMS3 Series TWIN3X DDR3 SDRAM The cutting-edge XMS3 series DDR3 memory from Corsair delivers outstanding memory performance and stability to any dual-channel DDR3-based motherboard. The Twin3x modules have been tested extensively to ensure optimal compatibility and performance. Dual-path Heat eXchange Technology Corsair-exclusive Dual-path Heat eXchange (DHX) technology utilizes both conductive and convective cooling paths to effectively remove heat from the memory circuit board for maximized heat dissipation, resulting in enhanced reliability, stability and performance capability even in the most extremely overclocked memory module. Pros: Works as advertised, straight outta the box. I've yet to experiment with overclocking them, but the huge heatsinks mean that I probably will eventually. Cons: If you have a large heat sink on your cpu, to the point that it extends over the ram a bit, make sure there is enough clearance to account for the huge heatsinks on these things. I had to stick these in the 3/4 slots on my mobo because of this. Other Thoughts: I had to manually set latencies in the bios, but that's my mobo's fault for not recognizing the ram correctly. Cons: 1 module did not work. I removed an egg for Quality Control, not for the product itself. Pros: Middle-of-the-road DDR3 that does precisely what it's designed to do. Heatsinks are great for overclockers and the price is where it's expected to be. Other Thoughts: Everyday RAM at everyday prices, but with heatsinks. Nothing more to say. Cons: I bought 4gb of this ram with 1 available rebate which was denied by Corsair . Their websight has so many rebates and ram chips that it is impossible to locate the right rebate for your ram. BEWARE of corsair ram rebates. It's like thay want to deny your rebate from the git go. Other Thoughts: Cant see any reason to buy pricey ram from Corsair in the future if they deny you on the rebate! Pros: Does what i want it to do. Cons: I have had a pair for a year and the price went UP. can't blame corsair or newegg on it i guess. Pros: Owned for 4 months. No complaints, works fine, which is all that I expect from RAM modules, and thus gets five eggs.